I am not disappointed in any way. Easy cleaning, nice job. Dimensions 10.0 In. X 10.0 In. X 25.0 In. I like that the vacuum was easy to put together and lightweight. It came with a battery pack and a charging station. I thought it would be larger, but its the right-size for my one level apartment. But if I had multiple floors it would be easy to carry up and down. The suction is good and I would buy another shark. I love this vacuum cleaner so much that this is the second Shark vacuum I’ve bought this year, and the very same model. It’s a dream to use. it’s almost too easy to grab it from its charger cradling the back wheels on the floor, then it fits easily into every nook and every cranny to get every last speck, and finally when the floor is clean it’s just as easy to put back in the charger when you’re done. I just received this a few days ago. It was easy to assemble, with very clear instructions. It was extremely clean and came with new filters; the dust cup was not "foggy" like clear plastics tend to get with use. There is only one little group of small scratches on the surface, but I would still give it four stars for cosmetics. I was very impressed with how much it picked up on the first run. I emptied the dust cup after each use and continue to be impressed with the suction. It is very light weight and simple to use. The charger makes a good holder, keeping the vac in place in a small amount of space. It comes with a "new" warranty on the working parts. I would recommend a refurbished Shark vacuum to anyone that needs a new or extra vac. This product has not enough power to vacuum small or big parts on the floor. I don’t know if this was defective, since it was refurbish, or if it’s just not that powerful. Reviews I read before buy this were good, but I really didn’t liked the product. I loved my older version of the Shark vacuum but the battery died. A new battery was more money than a refurbished one so I purchased it. It doesn't pick up any dirt etc. from any type of flooring that I have. I purchased a extended warranty so back it goes. It works ok, I love sharks products but it is really light. 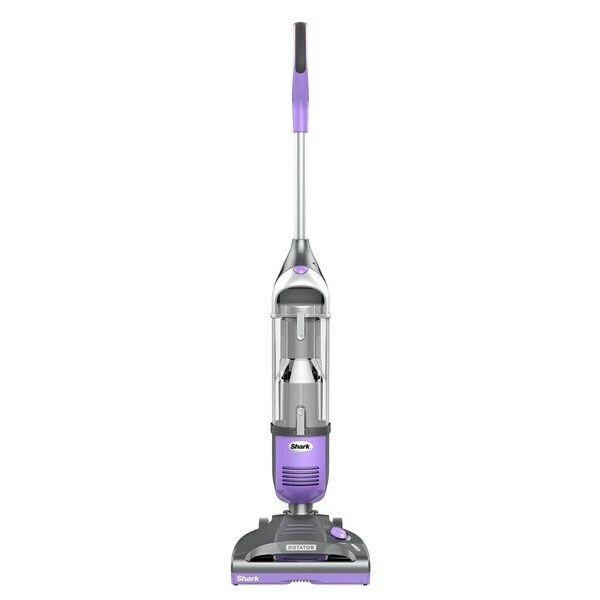 I use it as my second vacuum and it’s great to maneuver on stairs but would prefer a heavier vacuum. I love this vacuum. It's very convient, lightweight but it also picks up dirt very well. I highly rexcomend this vaccuum. It works very well on the floor as well as the carpet. Excellent product. Excellent price. Is lightweight and does a great job sucking up stuff. This vacuum was great for the first few months. We used it for a small area rug and it had a strong suction picking up everything. Within a few months it stopped working. We cleaned the vacuum out thinking it was a clog but that didn’t help the problem. Had the warranty and sent it back. Customer service was five stars.